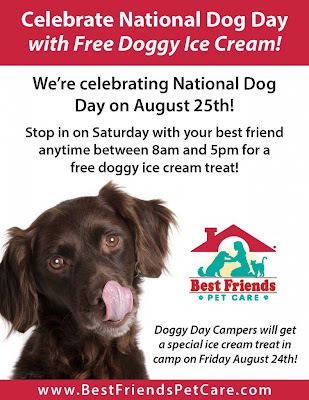 Best Friends is celebrating National Dog Day with FREE doggy ice cream! Stop by any of Best Friends Pet Care 42 locations today, Saturday, August 25th, between 8AM thru 5PM to pick up a Free Doggy Ice Cream for your pooch. Unfortunately it happens all too often that a dog is purchased on a whim. You, your child or another family member may see a puppy and for some reason all logic heads out of the window. The puppy becomes a must have situation and no thought goes into the major responsibilities that come with owning a dog. Firstly you need to remember that any dog is 100 per cent dependent on its owner to provide food, water, a safe and pleasant home and much more beside. It’s also important to remember that puppies grow into adult dogs and this happens very quickly. That tiny puppy you held in your hand could well be three foot tall in a few months and if your home isn’t klarge enough you are going to have problems. Then there’s the issue of exercise; accepted that dog in the toy breed category don’t require much exercise, but if you got yourself a retriever then it is not going to be happy being walked around the block on a leash. Owing a dog is a serious matter and consideration needs to be given to it long before you buy the dog. In other words think carefully and consider the commitment; a dog will live between 8 and 16 years. Check out your lifestyle; if the home is empty all day every day and you have a busy social life then getting a dog isn’t sensible. It will be unhappy and unhappy dogs get bored; it will damage your home making the situation even worse. Once you are sure that you are ready to own a dog think carefully about the breed you want. For example, if you live in a small apartment, don’t get a dog that requires a lot of space and plenty of exercise. If you aren’t at home some days then ensure you get a dog that is happy with its own company and won’t pine. Check out the American Kennel club website; you can learn about every single breed, their individual requirements, temperaments, whether they are suitable for a small family and so on. The website is a wealth of helpful and important information. When you have chosen the breed of dog you would like to own, don’t expect to get your perfect dog in a day or so. It may take some time; you need to locate a litter of puppies, then you need to check them out and make your choice. They may not be old enough to leave their mother so you may have to wait a few weeks. Sometimes it’s just simply really difficult to locate a litter, so you just have to keep looking. 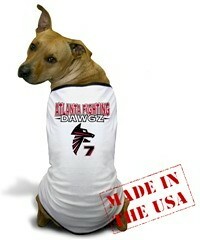 Make sure you have all the necessary things you need to make your dog feel at home. A dog likes company, but they also like to know what space in the home is designated as their own. It makes them feel comfortable and they will also go to it when they want to relax; it’s a place that’s like your bedroom. "Now there's an innovative way to treat your dog! New from PetSafe, discover the Lickety Stik liquid dog treat. It's a no-mess way to treat your dog with a highly enjoyable all-natural liquid treat." Pamper and train your Labrador Retriever with a Free Lickety Stik Treat. 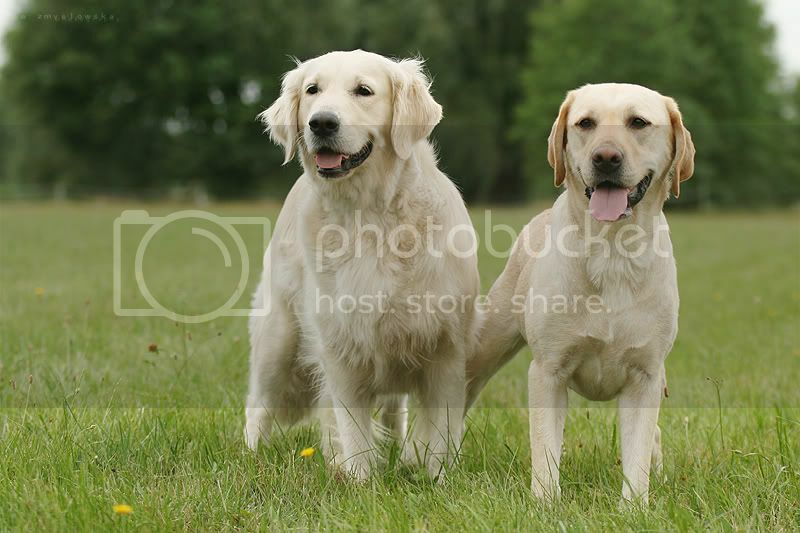 Differences between Labrador Retrievers and Golden Retrievers by Susan J Morris. It is no surprise that most people confuse golden retrievers with Labrador retrievers. This happens often and it's a common mistake among a few people, but as some people might be confused of the differences between the two, retrievers and Labradors have evolved differently. It's not only about the stature or the two breeds, nor the characteristic and the built and even the personality; but there are other things that make these two completely different from one another. The biggest difference between a Labrador retriever and golden retrievers, looking at it in it their activity level, the Labrador is most energetic compared to the golden retriever breed. They love outdoors as much as we do and they are more active and they need a good amount of exercise on a day to day basis. Don't be fooled though. Golden retrievers are active, but not as much as the Labradors. Looking at the structure of the breeds, side by side, you will see a difference in the features of the body. Labradors are more athletic than retrievers and they have a higher percentage with muscle mass. Next, you can see the difference between the two when it comes to their fur or coats. This is the most obvious of all when you compare the golden retriever with a Labrador retriever. The Labradors have dual-layer coats, with an oily outer-layer and soft under-layer. The outer-layer will help give them the property of being water-resistant. Another thing you need to remember is that the Labrador retriever has shorter length of hair compared to golden retrievers whose hair is particularly longer than that of a Labrador. Labradors have three different fur colors, which are black, chocolate brown and yellow and sometimes there are rare fur colors like silver or charcoal. Golden retrievers on the other hand have reddish brown to a light golden but most of them are mid-range in color. Labrador retrievers have been known to shed a lot, but this is not true in some cases. When compared to golden retrievers, Labradors don't shed as much as the long haired type of dogs that are the golden retriever breeds. The golden retriever breeds fur are more like to have tangles and matting and are a bit more prone when it comes to developing dry skin. The Labrador retriever, on the other hand, produces higher amounts of oil that nourishes the fur. The retriever needs to be groomed everyday just be steer clear from fur mats and many other possible problems. Labradors can be groomed at least 2 to 3 times in a week but once they start going through their seasonal coat change, then they too will have to go through the process of everyday grooming. When it comes to the breed's temperament, retrievers are more relaxed than Labradors. As we have mentioned before, Labradors are more active than the retrievers which is why retrievers are more prone to be overweight. With this being said, you can no longer mistake Labrador retrievers for golden retrievers. Find Black Labs and Yellow Lab Breeders at AshlandKennel.Com. A. Blue’s first visit to my veterinarian was unlike anything I’d ever experienced. He had odd little scabs and questionable paperwork, so much so that my vet had me get on the cell phone right there in her office to try to get more information. Those initial calls led to more questions, and ultimately to a phone call in which I was told that my 4-month-old puppy had been dangerously close to dying in a gas chamber, and that he’d also been “treated” for a rash with bleach. I’m a lifelong journalist with 20 years of experience in newspapers, magazines, and book writing. I know when I’m hearing something newsworthy. That, plus the fact I was Blue’s Mom and wanted to know all I could about him, made me decide to trace his background back to the animal-control center where he was once on death row. Q. When you first found Blue online you thought he was located in area of Pennsylvania not far from your home in New Jersey. You later found out he actually came from a shelter in North Carolina. How did that happen and why are so many dogs from the South brought north? What’s happening in dog-rescue today is truly amazing. Volunteer rescue groups that are hundreds of miles apart are acting almost like an Underground Railroad for dogs, moving them from the high-kill shelters that are predominately in the South up to willing adopters who are primarily in the more populated Northern states. Blue is one of the dogs who was lucky to be scooped into this rescue pipeline. A Southern rescue pulled him off of death row and coordinated with a Northern rescue to find him a home. The Northern rescue listed their own ZIP Code on Petfinder.com, and that ZIP Code was close enough to mine that when I searched for a local puppy to adopt, his photograph popped up on my screen even though he was still some 500 miles away. Q. Are the conditions in the shelters in the South worse than other parts of the country? If so, what are the reasons? There are certainly shelters and dogs that need help everywhere. The way the rescue advocates explained it to me, on the whole the need is greater in the South. That is why they focus their efforts in that region. The shelter where Blue was found in North Carolina, for instance, has a 95-percent kill rate if rescue groups do not intervene. That’s just one in 20 dogs like Blue making it out alive from a taxpayer-funded facility unless a volunteer group steps in. It’s hard to deny the horror of that statistic. Many advocates who visit similar Southern shelters use the word “slaughterhouse” to describe what they see. In the shelters that kill the dogs in gas chambers, the advocates often use the word “Holocaust.” What they are seeing is truly hard to comprehend. A number of factors are contributing to this reality. First and foremost is a failure to spay and neuter. Where spay/neuter rates are high, shelter intake numbers are almost always lower. In parts of the country where people fail to spay/neuter, including the rural Southern areas like the one where Blue is from, the shelters are simply overwhelmed by people bringing in box after box full of perfectly healthy, unwanted puppies. There is no place to put them, and there are not enough local adopters for them. So they are killed as if part of a factory line with no way to escape. Funding is also an issue. Many of these shelters simply don’t have the space and staff to handle the number of dogs being brought in. Even the shelter directors who are trying like crazy to get these dogs adopted are at the mercy of space and staff. Sometimes they simply run out of both, and the dogs are killed as a result even if they are perfectly healthy and wonderful. Last is attitude. When you have a shelter with a 95-percent kill rate, or a rate even remotely close to that, then something is happening in terms of an institutionalized attitude that the mass killing of these dogs is okay. That it is part of everyday business. That it is acceptable. The shelters that get their kill rates down adopt a different attitude, one that makes rescue a priority. Q. How did you gain access to the shelters and the officials who run them? Were they aware of what you were going to report? That’s a great question, because when I first began working on “Little Boy Blue,” more than a few rescue advocates told me I’d never be able to get inside these shelters to ask the kinds of questions that I thought it was important to ask. I think the reason I was able to succeed where others have failed is that I am not a rescue advocate. My intent wasn’t to embarrass these people or to shut them down. I’m a woman who adopted a dog and wanted to learn more about his specific background, as well as the big picture that landed him in that situation. The shelters didn’t see me as a threat. They saw me for what I was—a person asking questions instead of pointing fingers. I also had the benefit of being a professional journalist, so I understood how to go through proper channels. To access the shelter where Blue was found, I had to work in advance not only with the shelter director, but also with the county manager and the county attorney. I told them quite honestly that it was in their best interest to let me inside, because otherwise all I would be able to report was their sky-high kill rate. Being able to talk with the shelter director allowed me to show readers that he’s a human being facing real challenges, not a cartoon-like villain to be reviled. Q. Little Boy Blue takes a tough, honest look not only at the people who are running the shelters you visited, but also at some rescuers who are acting in a questionable way. How big has the network of rescue groups become and where are the failing and/or succeeding? It’s impossible to put an exact number on the size of the rescue network in America, but on Petfinder.com alone, more than 13,000 rescue groups are uploading photos and bios of adoptable animals. That’s an average of 260 groups per state. To put that into context, the Red Cross has an average of 14 local chapters per state. The rescue movement in America is absolutely exploding. All of these people have very good intentions, but since there is no official oversight, each group operates however it sees fit. Some rescues are far more professional than others, for the simple reason that they are run by people with business experience instead of people who are simply desperate to save dogs by any means. The rescues that are succeeding are as good at marketing and fund-raising as they are at walking into shelters and getting the dogs out. The best rescues are matching adopters with the right dog for them, not just with any dog. It takes real emotional mettle and business savvy to properly run a rescue organization that is best for all of the dogs and people involved. The more of these that we highlight publicly—including those featured in “Little Boy Blue”—the more that the smaller, fledgling rescues can learn from them. Q. Beyond spaying and neutering, what else needs to be done in order to control the pet population? One thing that we see in rescue is people giving their dogs back after a year or two. It’s more common than you might think. Sometimes it’s because people never really wanted a dog in the first place, but instead thought of the animal as a fun accessory that later becomes an inconvenience in their life. They say something like, “I am moving and I don’t want to be limited to apartments that only take dogs, even though my dog is really great and loves my kids a lot.” Those people, I have no idea what to do about, except maybe to ask their mothers why they never taught them proper respect for dogs who are members of their families. The other main reason that people give dogs back to rescues, or bring them back to shelters, is that they say the dogs “turned out” bad. This tends to happen when the dogs are 2 or 3 years old—and it is almost always a result of the human being failing to train the dog when he was a puppy. If a dog doesn’t know how to sit or where to go to the bathroom after you’ve had him for two or three years, it’s because you failed to teach him. It’s not a bad dog. It’s a lousy dog owner. If more people took advantage of training classes, which are usually just one hour a week, then far fewer people would be complaining that they had “bad dogs.” They would instead learn how to be better dog owners, and they’d want to keep their dogs forever. Q. You reveal in the book that nearly $15 million a year in taxpayer dollars go to shelters where dogs die in gas chambers. Why don’t more people know this and can be it stopped? People don’t know this because it’s never before been reported. It took me weeks upon weeks of working with state-based rescue groups to compile a list of all the American shelters that still have gas chambers, then even more time to send each of those municipalities letters demanding their budgets under the Freedom of Information Act . The information is hard to get. In one case, a county lawyer even tried to block me. No politician wants to be publicly exposed as spending tax dollars to kill pups like Blue in gas chambers. Advocates have been trying to shut these gas chambers down for some time, but they come up against surprising resistance in their state legislatures from lobbyists for veterinarians, farm bureaus, breeders, and county managers. There is an incredibly tangled web of politics when it comes to trying to save these dogs, one that made for fascinating reporting and, I hope, eye-opening reading. Q. What are some of the first steps people should take if they want to adopt from a shelter? I think the hardest thing for most people is the thought of having to walk into a shelter and see all the dogs there. When I walked through the shelters to report “Little Boy Blue,” it was emotionally crushing. It’s an incredibly hard thing to do. To me, one of the best things for adopters is the website Petfinder.com. The rescue advocates do the hard work of going into the shelters and getting the dogs out. The best rescues clean them up, test their temperaments, give them medical care, get them spayed or neutered, and put them in foster homes to learn basic training. When you go on that website and click on a photo from one of these rescue groups, like I did when I adopted Blue, you have all the benefits of saving a shelter dog without the heartache of having to go to the actual shelter. It’s a win-win. With that said, some rescues are better than others. It’s still very much a buyer-beware situation, and you want to make sure you are being told the truth about the dog you are adopting. Ask a lot of questions, demand transparency and records, and have your own veterinarian check the dog out. The best rescues will have no problem with you doing this. They encourage it, because they know the adopters are also looking out for the best interests of the dog. Q. Why do many people believe that purebred dogs are better than shelter dogs? Why do they continue to spend significant money on dogs from breeders and pet stores when they are thousands of dogs being out to death in shelters? A. Marketing. Shelter dogs have a marketing problem, while purebred dogs have a marketing machine. Think about the way you learn about dogs while growing up. The first question you learn to ask is, “What kind of dog is that?” The answer is never, “He’s a jogger,” or “He’s a swimmer,” or “He’s the kind of dog who is great with kids.” The answer is always a breed. “He’s a Beagle.” “He’s a Rottweiler.” “He’s a Poodle.” We have been taught since childhood that breeds are the way you identify dogs. We have been shown poster after poster that categorizes dogs by breeds. I’ve never once seen a poster in a veterinarian’s office featuring a picture of a dog who looks like Blue. He doesn’t fit that mold, so he’s not part of the marketing plan. So people are trained to think about dogs this way. Then they grow up and decide to get a dog, and they are bombarded with breeders marketing dogs as “purebred,” which implies that that dogs like Blue are somehow “impure” or less worthy. The purebreds are sold at a high price and labeled “champions” while the shelter dogs are often free and labeled “needy.” We become no different than teenagers who believe the $100 pair of jeans is better than the $45 pair of jeans because one has a label we know and is sold in a fancy store. It’s marketing, plain and simple, trained into us from the time we are children. The more people get to know shelter dogs of all shapes and sizes and temperaments, the more they begin to realize that we humans have been spoon-fed a massive marketing lie. Purebreds aren’t better than mixed breeds as everyday pets. They just have more posters supplied by the people who make money breeding them. Q. In addition to being Blue’s mom, you foster puppies on a regular basis. What should people know before they take on fostering? How do you deal with the emotional attachment that comes with getting to know a puppy in your own home? I think the most important thing is to be able to trust the rescue that gives you the foster dog. It took me a few tries to figure out that Blue and I do best with puppies as opposed to bigger, older dogs, because Blue is submissive and only weighs 40 pounds, and some of the older, bigger dogs tried to “put him in his place.” The rescue is very good about sending me the types of dogs that we are most comfortable having—that Blue and I both love to have around. I take Blue to meet the new fosters before bringing them home, too. If there is even a hint of them not getting along, I ask for a different foster dog, and the rescue obliges. And yes, it’s true that I develop an emotional attachment to each of my foster dogs. With some, it’s stronger than others. I just try to keep the mental picture that I have of all the dogs I saw in the shelters—dogs who are now dead because there was nowhere for them to go. Every time I give a great puppy to an adopter, I am making room for another great puppy who deserves the same chance at a wonderful life. Q. 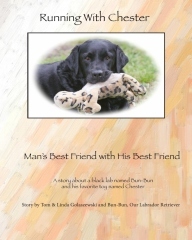 How has Blue adapted to life in New Jersey and is he ready to be the star of a new book? Blue probably should have been named Riley, because he certainly lives the life of Riley. Our home is on 5 ½ wooded acres at the end of a cul-de-sac with a huge fenced yard and a half-dozen state and county parks within about 10 minutes’ drive. He has an extended family who loves him so much that they dog-sit for him whenever needed, which means he has never once spent a night in a kennel with strangers. He has a foster puppy or two at the house to play with all the time, plus his canine cousins who are beloved members of our family. I work from home, so he also has human company all day long. He eats grain-free food and gets organic treats from the specialty dog store. He joins me at outdoor restaurants and is often invited to friends’ houses for dinner. He sleeps in the king-size bed with me at night, and under the covers if it’s cold. He will continue to be spoiled rotten for every day of his life—because he deserves it. He’s an awesome boy. 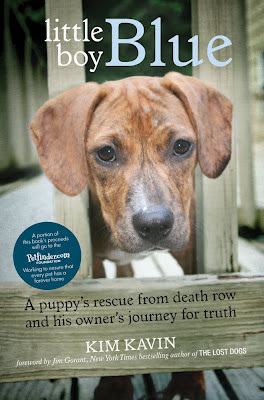 Visit our previous post to learn more about Kim's book Little Boy Blue: A Puppy's Rescue from Death Row and his Owner's Journey for Truth. Disclosue: This post contains affiliate link(s), which may result in compensation for AllAboutLabradors.blogspot.com. For more information about All About Labradors please read our Disclaimer and Disclosure Policies. We've shared this information to inform you of your option to either use our affiliated links or to go directly to the site of interest. "Whatever is causing your dog’s obedience problems, know that 99.9% of all dogs are good at heart and capable of learning exactly how to behave. It’s only a matter of finding the teaching method that works for them and being consistent in how you approach their issues." this list will slowly (or not so slowly) disappear for good. Your dog may not learn immediately, but when it finally sinks in and they understand that they cannot chew on your TV remote or pee in the front hallway, they will likely remember that for the rest of their lives." 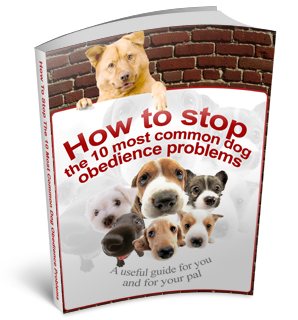 Download you Free Stop 10 Common Dog Obedience Problems eBook now and train your Labrador Retriever to follow the boundaries you have set for them. Starting today, August 1 thru August 3, My Favorite Pet Shop is offering Free Dog Safety Lights at 8:30PM EST. The first 100 people on each of those days will get a Free Dog Safety Light.